The voice of Pandit Jasraj is simply one of the most beautiful sounds in all music; an exquisite synthesis of air and earth projected with the fluidity of water, and the intensity of fire. The depth of his spiritual immersion presenting ragas, and his intellectual imagination developing ragas is matched by precious few among Indian instrumentalists of our time, and I believe he surpasses all other vocalists. Panditji began his musical journey as a tabla player, and his rhythmic invention and articulation is something to marvel at. There is a healing power frequently attributed to his music, something I have experienced myself, that places him among the legendary musician saints who have graced the world of Indian classical music going back to antiquity. By chance, I found myself visiting New York City from my home in Los Angeles during the time I was writing these introductory notes in August 2001. New York is famous for its pizza, and before heading for the Metropolitan Museum of Art late one Sunday morning, I stopped at the first pizza place I saw at Lexington and 84th street after parking my car on Park Avenue. This proved to be a most delicious if unconventional breakfast of coffee, and two slices of pizza. As I sat on a stool gazing out the large glass window at the passing people and cars on Lexington, I noticed a glass-covered magazine article hanging on the wall beside me. In the article, the owner of the pizza restaurant explained how the secret of great pizza was the weather. The weather? You see, the three main ingredients of flour, water and yeast are not to be mixed by any rigid formula. Rather, their exact proportions must be determined by the moisture or dryness in the air at the moment the pizza is being made. Now the Art of Raga is one of the most sophisticated and rarefied artistic endeavors in human history. Ragas defy simple and easy definitions, and are for most a developed taste. Here is my own definition: "Ragas are timeless, individual melodic jewels possessing spiritual resonance, and unlimited developmental potential." I was surprised and delighted to realize that there was a connection between the article I had just read in the pizza restaurant, and the interview introduction I was working on. Ragas also have three main elements, or ingredients: rag, tal and rasa, or melody, rhythm and expression. Most important of all, these elements must be improvised spontaneously, and true to the spirit of the moment, within the parameters of the particular raga. Even these parameters are not fixed in stone, and have been known to change gradually, and almost imperceptibly over time. Pandit Jasraj performed at the Palace of Fine Arts in San Francisco last Saturday evening in a benefit concert for the victims of the Gujarat earthquake sponsored by 5H, The International Association for Human Values. Those are the particulars. At one point during the first half of the program, which included Puriya Dhanashri, Shankara, and a bhajan based on Mishra Kafi, the music lifted off the stage, and headed out of the auditorium towards the stars. This ecstatic musical vision continued throughout the second half of the concert, joining with the unspeakable majesty and tenderness of Darbari Kanada beyond the ruins of time, and culminating with an extended bhajan, based on Bhimpalasi, that rained star-showers over the enraptured audience. What is Pandit Jasraj, but a musical saint who graces the world with his presence, illuminating through the art of raga a beauty, strength and imagination beyond dream. The burnished elegance of Kala Ramnath's violin, and the fervor of Vijay Ghate's tabla, together with the vocal support of Mukesh Desai, and the tanpuras of Subha Srinivasan and Kalpana Banerjee, all played important roles. When Kala announced that Panditji would open with Puriya, I was somewhat disappointed because I had never truly enjoyed or understood this classic raga despite the fact that I had heard it performed by several master instrumentalists. I did not see how Panditji could go beyond the interpretations of these other great artists. However, Pandit Jasraj is the master of the only instrument created directly by God, the human voice, and that seems to give him almost unlimited musical powers. He began with alap, gently caressing the swaras like a new-born infant, following the tenants of his gharana that teaches the swaras must not fight with each other. Like the glow of the late afternoon sun, the unique rasa of Puriya began to fill the auditorium, mesmerizing the audience with devotion, tenderness and timelessness. For the first time, I was experiencing the pure essence of Puriya. The visual presentation on stage for both concerts possessed a wondrous symmetry. Pandit Jasraj was in the center garbed in golden silk, strumming his swaramandala. Forming a semi-circle around him were Kala Ramnath on violin, and Vijay Ghate on tabla, with vocalist Mukesh Desai, and Subha Srinivasan and Kalpana Banerjee all strumming tanpuras like ocean waves upon the shore. It was a memorable confluence of musical colors. What follows is how the day of the interview unfolded on Sunday afternoon, Halloween 1999, at the home of Rohit and Kalpana Singh, in Oakland. The night before, Panditji gave a monumental performance with the sublime tabla artist, Swapan Chaudhuri. The text captures a moment in time when Panditji revealed his most intimate musical thoughts, assisted by his famous disciple, Kala Ramnath. When I arrived at the Singh home, Pandit Jasraj gave me a warm welcome, and invited me to sit beside him while he finished watching a Hindi film. Then he went into the kitchen, returning with an apple, which he peeled with a knife, and offered to me. The film went on for nearly an hour, and carrots and nuts were brought in to snack on. It was a musical comedy, and provoked much laughter from Panditji. After the film was over, Pandit Jasraj was curious to hear my music. Shortly after putting my Jaunpuri on the CD player, Panditji got up, and left the room. I was trying to figure out what his action meant, when he returned, appearing upset. He expressed concern that computer instruments might threaten to replace live musicians. Perhaps he had been expecting to hear the typical fusion-type music, rather than a classical composition based upon a raga. I explained to Pandit Jasraj that his fears were unwarranted because computers, sound samples, synthesizers and MIDI were only a new breed of musical instruments that could never actually replace live musicians. There was plenty of room for old and new ways of making music to coexist. He was reassured by my explanation, and responded by stating that live musicians would have to be better than ever in order to compete with the new computer instruments. Then we sat down to a splendid lunch prepared by Rohit Singh, the chef and owner of Berkeley's renowned Breads of India. Kala Ramnath insisted on serving us because I was a guest of her Guruji, and we continued listening to my Astral Palace (Malkauns), Sagarmatha (Shuddha Nat) and Chinese Legend (Udaya Ravichandrika, Bilaskhani Todi, Gunkali) CDs. I was honored when Panditji insisted on making the music so loud it completely dominated the space. In particular, there was a magical chemistry charging the air around us while the veera-infused, Chinese Legend, was playing. This experience was truly one of the highlights of my life. Here I was, dining alone on exquiste Indian food with one of the greatest Indian musicians in history, and he was delighted, impressed, and fascinated by my music. On top of that, one of India's leading violinists was serving us, refusing to sit down with Pandit Jasraj and myself. It was like a wonderful dream! It was gratifying for me to see that Kala was clearly proud of her student, beaming while she served us. 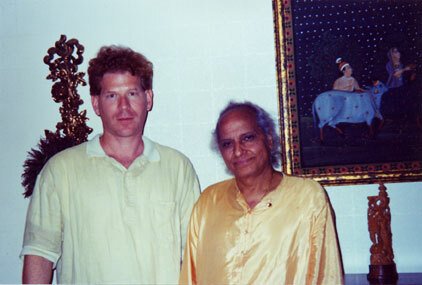 I studied privately with Kala during the summer of 1996, and those lessons were also one of the highlights of my life. She has the musical gifts, beauty, and grace of an Indian goddess, not to mention being an excellent teacher. Pandit Jasraj got up after lunch, went into the living room, and with great excitement, began repeating some of the phrases in From Hills of Snow (Bilaskhani Todi). We are now in the dawn of new ways of making music with technology, but it is important to realize that we are part of a continuum, and have deep ties to earlier musical forms. The individual is always more important than the medium, and the music of a genius like Pandit Jasraj will always be new and fresh, while the work of a less sincere, or less gifted artist will always be instantly old, regardless of whether or not they are using the latest technology. There is a degree of uncertainty in setting out into new musical territory, and I feel well-equipped to go on this adventure by doing my best to absorb the musical principles of Pandit Jasraj, and other giants, filtering the concepts their music embodies through my own temperament. 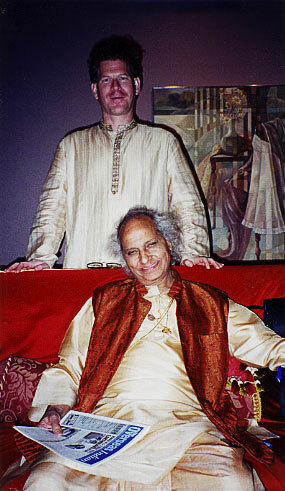 Pandit Jasraj believes that each artist must develop their own identity, and whatever instrument they use is secondary. He also told me he could teach me because "you have heart." There is no way to really indicate this in the text, so I want you to know that Pandit Jasraj spoke with the same passion and expression he gives to his singing. Just like in a concert, I was deeply moved by his devotion and passion for music. I was also much taken by his humility. There were a number of times during the interview when Panditji sang musical phrases, and again, I was awestruck because he sang with the same intensity and concentration you find at a concert. This interview was an unforgettable experience! One element of the interview I love is how we discussed esoteric topics that are difficult, if not impossible, to pin down with words, and sometimes the text reads more like poetry than prose. Throughout the interview, we were enveloped by the divine sound of an electronic tanpura that helped create a blissful rasa. Thank you, Michael. I'm honored that you wanted to talk with me. What with my knowledge, I don't think I am a very great knowledge person, but I will try to explain whatever you are thinking about. I just heard about your music. It was nice, really nice. Bilaskhani [From Hills of Snow] is wonderful. You have an Indian music knowledge you are showing in your music. Go ahead. Thank you. Two of my favorite ragas that I heard for the first time from recordings by yourself, are Shuddha Nat and Adana. I would like to ask a few questions related to your use of these two ragas as examples of your approach to music. The raga Shuddha Nat: What does this raga mean to you? Soordas, Vidyapati. Chandidas was only poet, but Vidyapati was definitely a singer and poet. You know Ramayana? Who was author of Ramayana? His name was Tulsidas. He used to sing, and he was a saint. So music is not for only enjoyment. The enjoyment is there every time, but it is a prayer to God. So, I always, when start my disciples, start to teach them: First, I explain to them, think of your mother, father. Think of your guru. Think of your Almighty. We have plenty of gods, so you can think of whatever which god you love, and offer, this is my service. Please accept it, and forgive my mistakes. And accept it, and please come. Please come in my... wherever you are singing, wherever you are making music. Wherever. You invite him, because God loves music. He loves music. You know Narada? He is a saint of Lords. Once Narada asked Lord Vishnu, "Where do you stay?" That's right, "Where do you live?" Then he said, he laughed, and said, "Why you are asking me?" "You should know where am I, where I be." Narada said, "No, you tell me." Vishnu replied, "I am not in heaven, I am not staying, living in heaven." Yogi means saintly people who do penance, prayer, and think of God only. "I don't live in their hearts too." "Wherever my devotees sing, I am there." So its my strong belief that God loves music. If you offer him, and invite him. Please come. I am making music, or I am singing for you. Now don't sing for any XYZ. Let them listen to your music, but think you are singing for God. That's his approach to music. That's what he is trying to say. No, just I am building. What before singing, what I think. The basis of this music is this. In my mind, or my heart. Wonderfully explained. I have never heard this explained so beautifully. Shuddha Nat is a full scale, major scale. [Sings phrase] This is major scale. You have to make music of this scale. You can make many, many ragas in this scale, same scale. Whatever Indian classical music shows one scale, it should be three ragas can be in the same scale, at least. KR: But the way it is sung. There are certain phrases in that, which show that this is this raga. In one scale, you can have three ragas, but the thing is that the phrasing, and the presentation makes the difference. What about the rasa. Is the rasa different for every raga? See? Just this phrase is the same in Dhanashri and Bhatiyar, but after that Bhatiyar becomes different. Let me raise a subject that I have heard many questions about. For example, the Ga from Dhanashri, Shuddha Nat and Bhatiyar: Is this the same Ga? ... or are they different? You have shrutis, right? So sometimes Ga leans more towards the Ma, and sometimes Ga leans more towards the note down. We have, you know, twelve notes, minor and major, but we have twenty-two shrutis. From where these twelve notes have been picked-up. Twenty-two may be conducive to Indian music, so they picked-up twenty-two, and out of that they picked-up twelve. And these shrutis show if this Ga is higher, or this Ga is lower. That's how the weight of that Ga differs in each rag. Timing [time of day or night] and neighbor notes: They change. So, this takes a very advanced feeling for pitch, to be able to differentiate between different shrutis. It could be the same Ga, the major Ga, but that Ga could be either a little higher, one shruti higher, or one shruti lower. But it takes a very strong ear to able to distinguish that. This is what makes the ragas so beautiful. Now Bhairav Ga, [In my excitement, I had mispronounced Bhairavi, and said Bhairav, another famous morning raga, so Panditji uses Bhairav as an example] the same shuddha Ga, the major Ga in Bhairav. Gandhar in Shuddha Nat, the gandhar is the same. Dhanashri gandhar is the same. Last night I sang Purya Dhanashri. Gandhar is the same. I want to explain to you rishab. In Bhairav, rishab is minor, and yesterday I sang Puryia Dhanashri, where rishab is minor. And there is one major rag, Shree, where rishab is minor. So I will explain two types of rishabh, and it shows the timing of the ragas. Why is one rag, Bhairav, sung in the morning, and Puriya Dhanshree, or Shree, sung in the evening. Purya Dhanashri is sung in the evening. It is the same Ri. How it changes. How the feel of the raga changes. Listen how we go towards rishabh. This is peculiar thing you should know. How we go towards rishabh. In Bhairav, in Shri, in any other which is minor. First, I will show you:[Sings phrase in Bhairav] Now the same rishab:[Sings phrase in Puriya Dhanishri] The Bhairav rishab is higher. Why is it higher in Bahirav? This is very new for me. I am telling you. Evening rishab. Why this is going down towards Sa? When its going up, its higher. The morning its higher, the evening its lower. The same minor Ri. Do you think this raga began as a prayer for the setting sun? Maybe a thousand years ago? That this was a song? One person asked me this question at the University of Toronto, the same day they announced the scholarship in my name. How do you differentiate between the morning ragas and the evening ragas? Would you then say that the mid-day ragas are neutral? The mid-day ragas? So could you say that this has something to do with the cycle of the day, the energy of the day. The day is beginning, and then the day is withdrawing? Yes. Its like human being who gets up in the morning. He has lots of energy, and in the evening he is kind of drained out, and tired. Like the tides in the ocean? That's fascinating. When you are performing a rag, say Adana, are you also thinking about stories and legends, and deities attached to it? You are singing. Written by a very great saint, there is a phrase for God. And the rag Adana is a ... you know veera? The strength shows. The raga shows veera. There are nine, you know. So it is veera. Strong, shakti. The song of the Mata Kalika. Is the goddess of the evil destroyer. Oh! That's what this raga is. No, the song. The song Mata Kalika. Kali is the mother who destroys all evil calamities, and the rag itself, the rasa of the rag is courage. Strength and courage. Listen: The same swaras: Jaunpuri, Adana, Darbari Kanada. The scale is same. Asavari thatt. Scale is the same. No, there is no change. But how it makes different type of music. Totally. There is no connection with any ragas. The combination of notes, the phrases. All these things make a difference. Does the interplay of the voice, or it could be the flute or violin. The interplay of the voice and the tabla: What does this mean to you? The interplay between the two elements. One is pure melody, and the other is pure rhythm, and they mix together. Beauty. 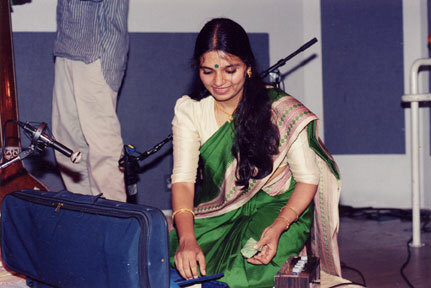 The beauty of Indian classical music is because we give full... we feel in our music. Swara is the mother, and Laya is tal, the father. That makes music. Would you say one is female and one is male? You began as a tabla player. Is that true? Because when you sing fast passages the rhythmic excitement is very strong. I used to play tabla. He is very famous table player. Andolan. Andolan means you are traveling only gandhar. Sometimes is lower part, sometimes is upper part. See, this is where you have the shrutis we were talking of. Guruji was saying, so he was touching. Its the same Ga. You come down, and you go up, but you're still in Ga. You're not in Ma, you're not in Ri. And you're not in shudhha Ga either. You're not even in shuddha Ga. You're still in komal Ga. The minor tones, the microtones. In Shuddha Nat, there is no andolan. [Sings phrases] There is no andolan. Tanpura is the melody. Tanpura helping you to make melody. First thing, if you have some note. San Francisco. Zero kilometers or miles. San Francisco. If you know that San Francisco from here is this much mile, then you can make a rag. This is our base. San Francisco to Las Vegas, San Francisco to Los Angeles. Whatever the tanpura is giving us. Tanpura is giving us that this is your base, this is San Francisco. Now you go and come wherever you want. The same thing its giving us. So if you have a particular note which you made Sa: [Sings examples] The tanpura gives us a base. From this note you can make ragas. You have to stress one scale. What would you say are... the unfolding of a raga. Alap, jor, jhala. The vocal is different from the instrumental unfolding of the raga. Are there any principles that you use? You start the raga very slow, obviously, then you go into a slow gat. It is there. Without principle you cannot make a shastra. Without the principles you cannot have theories. If you have a principle, that means we have everything. Rag system is totally different. A rag: First you have to make this kind of outlines. Think that this is a painting, so make some symmetrical things. But this is the way we make music, and we make rag. If you mask it, it won't be rag. It won't be as symmetrically as swaras. If you change the color from here to pink, if you have the orange there. This theory I'm hearing from you. Its news to me. Something very nice, because everything attached to human body. Swara, laya. You know, you have one street to walk. Same street. Speed is not mine. That's whatever it is. Speed yours. Its your lay. And whatever it is, its mine. When I compose using a particular raga, I almost feel like the shape of the raga... It touches different points in my body, different physical sensations. Do you feel this when you sing a raga? Your body feels different physical sensations? Sure. Different part of. You stand on one note, it gives you different feeling. If you stand on rishab, it gives a certain feeling. If you stand on fifth note, pancham, it gives feeling other. In terms of melody, there is loud and soft. In pitch, there's low and high. Do you also think of depth? Close and far away? Do you also think that way? So all of these dimensions are part of the fabric you create with your melodies. Your experience and research is very deep. Really! You have given me a very good incentive in the human body's heart. Twenty-two parts. Its a very famous book. I know you've heard of it. I just can't remember the author's name. I'll find out for you. But he said its the breath touching each different part of the heart that gives each shruti. Its very interesting. Is there something that you would like to add perhaps? I could go on and on, but I don't want to keep you too long! I'm talking to you. I'm really surprised that you know so much about Indian music. And apart from that, you are making towards human nature. Comes from human body. And you know the vina is man-made vina. This vina, [human body] God made. And we call it Gatra Vina. Gatra means body. Gatra means body, and vina is there. Humans make music, or sound, is a vina. Would you say that you sing a bhajan with a different feeling than a raga, or is it the same? The raga, different raga, but is a prayer of God. The rag is there. Whenever I sing bhajan its a prayer of some god. Say, about particular god. God is God. I told you that God loves music. Why not I play for him if he loves it? If you know the music, I should call you, and ask you. I should compell you to come, and sit here. Why not God? He's everywhere. God is everywhere. But just you have to invite him, or you have to say his name: God, Vishnu, Shiva. He's there, he's here. And I'm telling you, whenever you sit, think of God, the mother, father. You will see that what kind of music you can create. Afterwards, you can remember me. You'll remember me. You can tell me. What I am giving you. What kind of things I am giving you. Just prayer of God. Prayer of your mother, father. And whoever you feel that he is my guru, offer it. Ask him, "Forgive me my mistakes, and please come, and accept my service." That's it! Whenever we start, whenever we touch. Any. We feel its a new born baby. How do you play with new born baby? Your alertness. Apart from that, you can't touch hard. Very soft. Very soft, and slowly. Slowly is going the baby. Wonderful analogy. I never heard this analogy before. Love. You can give. You can love. You continue like that in this manner. Whatever I play, its a new born baby. Whenever I start. And towards the end, is it become a girl or boy, whatever it is. Do you perform ragas longer in India than in the United States? No no. I don't make any change. I don't compromise. Whatever my singing, it depends on audience. Depends audience. I sang one-hour, fifteen- minutes, one part over here, and the same one-hour, fifteen-minutes over there. Sometimes I sing twenty-minutes a rag there, and over here. It is state of mind. Do you feel when you play with different table players that it effects your performance differently? Like when you play with Swapan Chaudhuri, or Zakir Hussain. One thing I want to tell you: There was one concert in London. As soon as I got down from my plane, the organizer came, and said, "Panditji, we couldn't find a harmonium player!" I asked, "Zakir is there?" "Yes." "That's all. I don't require anyone." You find my answer? So Zakir is there. He can accompany you as a harmonium player through his bayan. He makes notes. A clear note. He's a great tabla player, there's no doubt. Apart from that, he make new type of music through his bayan technique. When did you first play with him? I don't remember. I knew him in 1964, and maybe the same year he played with me. I've read, Panditji, that you know more ragas than most great musicians. That you have a great repertoire that's very unusual among the leading musicians. Is this correct? How do I say yes or no? Yes. Its true. He has a really wide repertoire. I see that you have a series of at least eight different ragas from the Kanada family, and I have almost all of them. The subtleties between them is fine, its a fine distinction. It takes a long time for a Westerner like myself to hear the differences between ragas that are closely related. Like you said before. The three ragas that use the same scale. That, for me, is almost the most difficult thing. Jaijaivanti is very distinctive. It has both forms of Ga, and both forms of Ni. Or Jog, also with both forms of Ga. That's easier for me to identify. But like you said, the subtler differences take more experience. Why do you want to learn from me? First of all, I learn just from listening to your music. I have to learn more. I want to grow. You want to grow more. That's a very good way of thinking. Everybody thinks in music in India that he is a student. I still feel that I am a student. Whenever I teach Kala, whatever I ask to do her, she immediate. And then some little change by mistake, or by choice. She make me a different type of music. Whatever I produce, and she produce, it makes some different type of music. So I'm learning from her also. By teaching you are learning. Afterthought: One day I was pondering Pandit Jasraj's remarkable voice, and wondered if it bore any resemblance to another vocalist. I was stunned to realize that there is a very famous singer who shares some uncanny vocal similarities with Pandit Jasraj, even though the musical milieu is completely different: John Lennon. Use your mind's ear and think about it! Special thanks to Kala Ramnath for making this interview possible. Special thanks also to Rajesh Yadwad for transcribing the words for most of this interview.